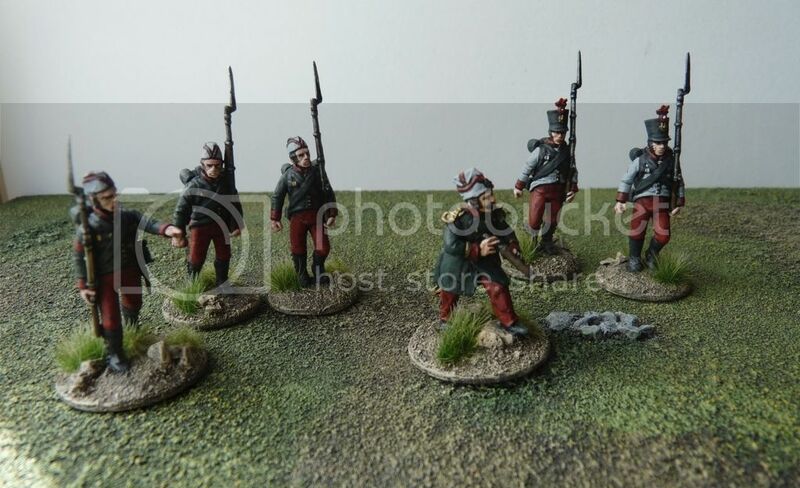 Author World2DavePosted on 19th September 2017 Categories GamesTags 19th Century 28mm, Colonial, Sharp PracticeLeave a comment on St. Valentio Skewered by El Kebab! A week or so ago we played the remaining part, which saw the Medetian rearguard holding the bridge that the village raiding force would need to use in order to return to the ship. The bridge defence force had been determined by Jase at the start of the first game and contained a bit of a mix of army and naval types. Jase deployed with a perimeter of 2 groups of line infantry on one side of the river, and a group of Bersaglieri plus the gun (in a central position, on a rise giving a good view in most directions) on the other. He kept a reserve of 2 groups of sailors – at the pub, naturally. He had supporting assets in the form of a Holy Man and a handy additional Level 1 leader. As dawn broke my Fleurian patrols converged on the bridge. I would be rolling for their arrival points, and had decided to split my force into a cavalry command (2 groups) and an infantry one (1 group of Grenadiers, 2 of Line infantry and 1 of skirmishers). As it happened these 2 commands came on from opposite sides of the table, but due to some freakish card drawing (early Tiffin cards after 3 re-shuffles) no-one actually appeared until the 4th turn. I should have ruled that the sailors would by now be too pissed to fight, but it didn’t occur to me at the time! On the other side of the table, my pretty 2-group formation was hammered on its approach by canister from the gun, despite my other groups trying to pin down the artillerymen with musketry. By the time I got the line close enough to do some damage it was being hit from all angles, as the nearest sailors joined in the fun from the pub garden. I did see off the gun crew in the end, but losses and shock meant the game was up for the Fleurians and they skulked away, leaving the Medetian raiders free to return via the bridge and make a successful withdrawal back to their ship – and home for tea and medals. Well done Jase, 2 out of 2! This was another good fun game of Sharp Practice, and we are becoming more confident we’re playing the rules properly (at least most of the time). Hopefully we’ll return to the fray in a few weeks. Another nice model kit from Warbases, this wagon was quick to put together (once I’d worked out the assembly order). Everything fitted neatly and the engineers’ equipment load can remain loose for removal when not required. Great value and perfect for Sharp Practice, either as a general wagon, engineer option, or just as a piece of scenery. So, on to the second game of the weekend. We did some mild shuffling of the terrain and scenery and came up with a simple plot for the game. Word has reached the respective HQs of both armies that a brave/notorious (depending on your point of view) female spy has been exposed (ooh-er) nearby, and both sides have dispatched a small force to bring her in before the enemy can get to her. Despite their recent exertions, the two forces from the first game are the closest troops to hand, and they are duly ordered into action once more. On the run, the spy has gone into hiding in one of the cottages (placed in secret by a neutral assistant we drafted in for the purpose) in the small border hamlet of Frinchy. We’d have to enter and search (defined in the rules as a Task) these buildings in order to discover her, and naturally there’d be some violent competition to get there first. Jase’s Fleurian skirmishers and line infantry move rapidly towards Frinchy. My Medetians were busy doing likewise at the other end of the table. Somewhat freakishly, both players managed to collect 4 command cards before the end of the first turn and both used them to activate their force commander a second time, granting them useful extra movement for their troops. In the following turns Lambrusco left his men to cover the door while he dashed inside to check the premises for the elusive spy. Despite a quick, thorough search, he came up empty-handed. Meanwhile, in the middle of the village things were hotting up. The Fleurians managed to take up some useful positions, hurting the Medetians with effective fire and knocking out their force commander, Captain Gattinara. This left the Medetians with a command and control problem at a crucial time and they continued to come off worse in the on-going exchange of volleys. The leading column was halted, with casualties and shock building up. Another group under veteran Sergeant Fiorentina did manage to enter one of the other cottages to search it, but were badly shot up as they made their way inside. Again they found nothing (albeit this was unknown to the Fleurian player) and clearly this meant that the spy was in the building that was currently surrounded by Fleurians. Damn! By this time the Fleurian leader, Captain Corbieres, had established a strong central position and used a couple more flurries of command cards to very good effect. He was able to detach a group under Sergeant Luberon (whose derriere seemed to have recovered since the last game), who redeemed himself by duly locating the spy and escorting her at great speed through the trees and away from the fighting. The Medetians tried to press forward to harry the enemy’s withdrawal but struggled to make headway. Captain Gattinara rose groggily back to his feet but could do little to get a pursuit underway quickly enough. The Fleurians had won the race to find the spy and the firing petered out as they fell back the way they’d come. After the game we drew a card to see which side the lady in question had been spying for, to ascertain her likely fate now she had been discovered. As (her) luck would have it, she turned out to be working for the Fleurians and therefore the outcome was a successful rescue of their own heroine! The men on the ground wouldn’t have been privy to this information when they received their orders, they just had to carry out their mission as best they could. So, glory for Corbieres and little for the Medetians this time, but there’d be another chance to win some honour soon enough. I’m keeping a bit of a tally on the leaders (Big Men) that are involved in my Sharp Practice games. There are chances to win promotion or receive awards for valour, and one or two are getting close to qualifying. Whether they can do so before making the ultimate sacrifice remains to be seen! One post-game note: neither my musician nor Jase’s Holy Man had any impact in either game, circumstances just didn’t give us a chance to call on their potentially beneficial effects. Next time perhaps! In between drinking the occasional beer this weekend, my friend Jase and I gave SP2 a couple of goes using my 28mm post-Napoleonic imagi-nations collection. As expected, the rules gave a very satisfying gaming experience and, once we’d got the gist of things, we really got into the command challenges they present to players. I can certainly see why so many people are playing this revision of the rules. After a small test session with a couple of groups a side to get some familiarity with the core mechanisms, we mixed and matched a bit with scenarios for the 2 games we played. For the first game we drew from Neil Thomas’s One Hour Wargames book, which a lot of people seem to use as a go-to place for clearly defined, interesting scenarios. We chose no.4 Take the High Ground as it offered a focus for a fight and would get us into action pretty directly. The forces were drawn from my Medetians and their perpetual enemy, Fleurie. I haven’t looked at the force/army lists for SP2 in any great detail yet, but clearly there’s plenty of scope to tailor troop characteristics and capabilities to get to where you want. For simplicity, we went with the Medetians using Peninsular Portuguese unit types and the Fleurians using Peninsular French. For the first game we rolled for support and this generated us each 4 points worth to choose from the list. As the Medetian commander I selected a further Level I leader to increase my command options a bit, and a musician to extend the command range of my leader. Jase’s Fleurians gained a Level I leader too, and a Holy Man for a bit of shock-removing inspiration when it would be needed. No blow-by-blow account, but here’s some of the action from Take the High Ground, SP-style..
.. well, except possibly that lot! The Fleurians arrive en-mass, with skirmishers out in front and 2 assault columns following behind. Fleurian Voltigeurs move to the flanks to start harassing fire on the Medetian line, creating space for the columns to move through in the centre. Men in blue start to fall and they’re forced to loose off their initial volley to hit back at the pesky skirmishers. Despite this amusing set-back, a well-coordinated Fleurian attack sees Voltigeur fire cause further Medetian casualties and a lot of shock, which is followed up in the same turn by both columns hitting home. Although the defenders did some damage in the ensuing melees, they’re almost wiped out and the survivors flee. Can the Fleurians get re-organised into line on top of the hill before the Medetians can launch a counter attack? Although doughty Captain Gattinara has led the main Medetian body (3 groups of line infantry in a formation) forward in a fairly leisurely fashion, he suddenly gets a hurry on and the line surges forward a maximum roll of 12″, arriving on the crest of the hill at the perfect moment. Lambrusco’s rifles have been pouring accurate fire into the flank of the nearest column, causing 3 casualties plus 10 shock in 2 rounds of shooting, and causing the Fleurians to recoil a little from the top of the hill. At that point 24 Medetians present their muskets and deliver a devastating first fire volley, clearing away both enemy columns and securing the hill, and victory. Final positions. Although their plan was a good one, and they enjoyed initial success, the Fleurians are in too poor a shape to rally and try again. They concede the hill to the Medetians and withdraw. Losses were fairly even, as was the remaining force morale for both sides. This was an excellent introduction game for us, we really enjoyed the command and control challenge generated by the randomness of the leader activations and the options presented by the command (flag) cards. There were always choices to be made, which you felt you could focus on without getting bogged down by the moving, shooting and fighting mechanisms, which were mostly committed to memory after the first few turns. We then re-set the table for a second game, which will be the subject of the next post. Before getting back to my 6mm FPW stuff, I painted a few 28mm figures on returning from the Ayton weekend. Normally I’d be burnt out after hitting the big deadline, but apparently not this year! Nothing special, just a few more bits and pieces ahead of further Sharp Practice games I want to play this summer. They were painted in 1s and 2s and weren’t too onerous. I’ll probably pick off a few more lead-pile stragglers over time just to keep my interest levels up while I concentrate on other projects. Then there were a couple more Fleurian line infantry that I didn’t need for Ayton but who will round out my 3rd group of 10 for Sharp Practice, plus some further Fleurian light troops. These include a couple of big men (an officer and a sergeant) and a couple of extra soldiers to go with the mountain gun to make the crew up to the normal group of 5. If I hadn’t creased the flag so thoroughly it would be possible to read the wording that says this is the flag of the 1st Line Regiment. It’s in there somewhere! As with other flags I’ve done recently this is a clip-art based print-out that I’ve painted and highlighted up. This guy will join the rest of the regiment in time to go into action at the weekend. He’ll probably be leading the retreat!